“Dentistry is a relationship business” so why are we relying so much on technology to build those all-too-important relationships with patients? Technology is impossible to avoid. This is the world we live in now. But does this mean we’ve forgotten how to interact with people — speak to people face-to-face or on the phone? There is nothing wrong with having technology as an assistant when you are simply too busy to be on the phone calling your patients to remind them of upcoming appointments; the thing to note here is that using technology to assist you and using technology to build relationships for you are two very different motives. I’m not quite a millennial, I missed the generation by two years, but I did see the rise of social media as it grew from infancy to adulthood. How often do you use your social media networks to connect with people? When was the last time you used your smartphone to call someone? It feels like, as connected as we are, we have put a digital distance between us and others, whether in our circle or not. How does this attitude then affect the patients you connect with using only email or only text? The less physical interaction you actually have with patients, the higher chance you’ll experience no-shows and cancellations. Technology is there to help, to assist, to make busy days a little less busy, freeing you up to focus on more important tasks, but those more important tasks should include building relationships with your patients. I have a fairly interactive relationship with my dentist, but there would be nothing more off-putting to me than seeing only emails to remind me in as impersonal a way as possible that I have an upcoming appointment. Just for a moment, take off your dental professional’s cap and ask yourself honestly if you preferred your dentist giving you a call or sending you an email. Be the patient and see if you agree that these solutions could, in fact, help keep the hygiene schedule full. The best form of interaction when you can’t go door-to-door is picking up the phone and talking one on one with the patient. Not only does the patient appreciate that you took your time out to call them, but it makes it harder for patients to cancel. Sandie suggests avoiding words like “cleaning” in regards to a hygiene appointment, because “ A cleaning is something that can wait. It’s not an important appointment in the patient’s mind.” Instead, change the wording. You are not teeth cleaners, you are healthcare professionals “who perform therapeutic services that affect your patients’ overall health.” This can convey a message of importance and necessity that a word like “cleaning” cannot. This entire system is built on the idea that you know who your patients are, so if you do not take time to get to know your patients on a personal level, this isn’t going to work out so well. Ask yourself this: how well do I know my patients? Do I know which ones prefer the human interaction over email and text? Do I know which ones are too busy to talk on the phone for any length of time? Do I know enough about my patients to make a decision about how I connect with them? If the answer is no, then it’s imperative to the success of your practice that you make getting to know your patients priority one. The only way to build a solid relationship with the patient is to start from the very beginning by being sincerely invested in their lives and their goals and, most importantly, their oral health. A new patient will become a loyal patient with just the right amount of investment and care. A friend of mine left his last dentist for only one reason: the dentist didn’t care. He sent form emails, never called, never even bothered to ask how my friend was feeling. And the prices at his clinic were decent. But emotional investment matters. And if patients think you have none, they won’t just cancel and skip appointments, they will start looking for another clinic. Take the first step as soon as a new patient enters the office and start building the relationship. I guarantee that sending a reminder text or email every once in a while will seem a lot less impersonal. Some patients (like me) would really prefer the phone call over the email or text. In Sandie’s article, she puts forth the example of the dentist who sent email reminders to patients who preferred the human-to-human interaction. If you know who your patients are and what they prefer, you can give them the experience they want and deserve and therefore prevent losing them in the technology shuffle. Here’s a radical idea – do both! My current dentist not only sends me a reminder email a week before the appointment, he will have the office manager call me one day before to ask me how I’m feeling and remind me about my appointment. She asks if I have any questions or concerns, giving me reason to believe they actually care. So send an email, send a text, but don’t rely on technology to build and maintain your relationship with your patients. In addition to those automatic reminder emails and texts, show you care by picking up the phone and starting a conversation. As a patient myself and in connection with a lot of other patients, I can tell you firsthand that being more emotionally invested and choosing to call and start a conversation is the pathway to patient loyalty and fewer cancellations and no-shows. Remember, you can do both, just as long as you don’t rely on technology to take care of your patients for you. 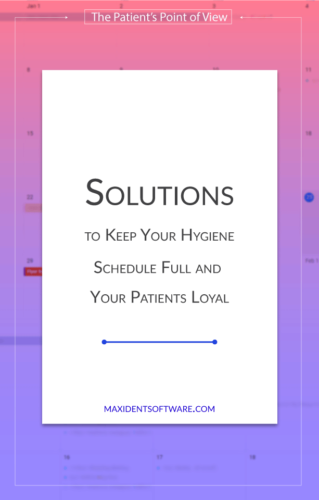 For more tools to keep that hygiene schedule full, I recommend reading Sandie’s article by clicking the link below.